Don't be fooled by the outward appearance of this 1962 Pontiac Catalina. Although there are few hints beyond the "Caution Aluminum" printed on the fenders, what appears to be merely a low trim level Catalina is actually a rare and high performance Super Duty equipped beast. When the Pontiac Super Duty 421 V8 was introduced in late 1961 it was exclusively as a tool to continue Pontiac's success on the race track. The hand built engines were the highest displacement engines to date and predictably fueled the muscles car wars that were just heating up. For 1962, under the pressure of changing NHRA rules, the 421 V8 that had been successful on the track as well as other Super Duty options were available on street cars. In street form, The 421 V8 came with twin Carter 500-cfm four-barrels and an aluminum intake manifold, which were good for a rating of 405 horsepower. Like so many great muscle cars of the 60s, actual power output is estimated to be another 50 or 60 horsepower higher than Pontiac's rating. As part of the full Super Duty race package, Catalinas were equipped with a hood, fenders, inner fender panels, radiator support, front and rear bumpers, front bumper brackets and headers all made from aluminum to give the massive 421 a few less pounds to push. The combination was good for then unheard of quarter mile times in the 13 second range at over 100 MPH. 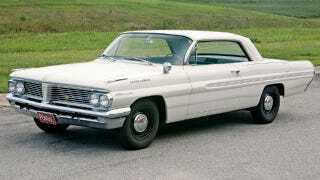 A total of 162 Super Duty Catalina's left the factory with the 421 V8 in 1962 (16 found themselves into Grand Prixs). As you might imagine, anyone willing to spend over $5,000 for a Super Duty Catalina, put it work winning races on the street or the strip. This high performance lifestyle affected the survival rate of Super Duty Catalinas making mostly original examples like the one found here on Ebay a rare find among already super rare cars. This particular Super Duty Catalina has only traveled 13,400 miles in its life, although we feel safe guessing a decent amount of those were traveled a ¼ at a time. Even so, this car surely doesn't show the signs of a lifetime spent racing. According to the owner, the numbers matching 421 V8 has never even been out of the car. The rare turquoise bench seats look to be in very nice original condition. We love everything about this car. From the racing history to the turquoise interior, this is truly a wolf in sheep's clothing. Almost 50 years later, the power and performance numbers these Super Duty Catalinas produce is still very impressive. It appears we are not alone in our admiration for this rare Super Duty. With only a few hours left in the car's Ebay auction, bidding is currently in six figure territory.